This antibody detects a 130 kDa protein corresponding to the molecular mass of phosphorylated BCAR1 on SDS-PAGE immunoblots of pervanadate treated human A431 cells, but not in control cells. Synthetic peptide (coupled to KLH) corresponding to amino acid residues around tyrosine 762 in the Src binding domain of rat BCAR1. This rat sequence is the same as Tyr-664 in human BCAR1 and Tyr-664 in mouse BCAR1. This site is also highly conserved in Cas-L (HEF1, Nedd9). This antibody was cross-adsorbed to phospho-tyrosine coupled to agarose and to phospho-BCAR1(Tyr-751) peptide before affinity purification using phospho-BCAR1(Tyr-762) peptide (without carrier). Our Abpromise guarantee covers the use of ab41827 in the following tested applications. WB 1/2000. Predicted molecular weight: 130 kDa. Widely expressed with an abundant expression in the testis. Low level of expression seen in the liver, thymus, and peripheral blood leukocytes. The protein has been detected in a B-cell line. Belongs to the CAS family. Contains a central domain (substrate domain) containing multiple potential SH2-binding sites and a C-terminal domain containing a divergent helix-loop-helix (HLH) motif. The SH2-binding sites putatively bind CRK, NCK and ABL1 SH2 domains. The HLH motif is absolutely required for the induction of pseudohyphal growth in yeast and mediates heterodimerization with NEDD9. A serine-rich region promotes activation of the serum response element (SRE). The SH3 domain is necessary for the localization of the protein to focal adhesions and interacts with one proline-rich region of PTK2/FAK11. PTK2/FAK1 activation mediates phosphorylation at the YDYVHL motif; phosphorylation is most likely catalyzed by SRC family members. SRC-family kinases are recruited to the phosphorylated sites and can phosphorylate other tyrosine residues. Tyrosine phosphorylation is triggered by integrin-mediated adhesion of cells to the extracellular matrix. Dephosphorylated by PTPN14 at Tyr-128. Cell junction, focal adhesion. Cytoplasm. Unphosphorylated form localizes in the cytoplasm and can move to the membrane upon tyrosine phosphorylation. Western blot analysis of A431 cells serum starved overnight (lanes 1 & 3) or treated with pervanadate (1 mM) for 30 minutes (lanes 2, 4-6). The blot was probed with anti-BCAR1 (lanes 1 & 2) or anti-BCAR1 (Tyr-762) (lanes 3-6). The latter was used in the presence of no peptide (lane 4), phospho-p130 Cas (Tyr-762) peptide (lane 5) or phospho-BCAR1 (Tyr-751) peptide (lane 6). 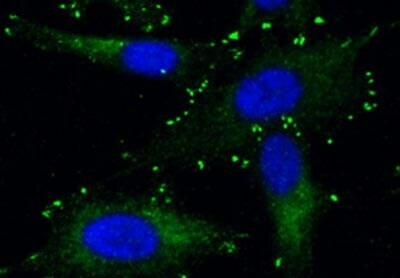 Immunocytochemistry/ Immunofluorescence - Anti-BCAR1 (phospho Y762) antibody (ab41827)Image from Zheng Y et al, J Biol Chem. 2012 Jan 2;287(1):148-58. Epub 2011 Nov 14, Fig 4. 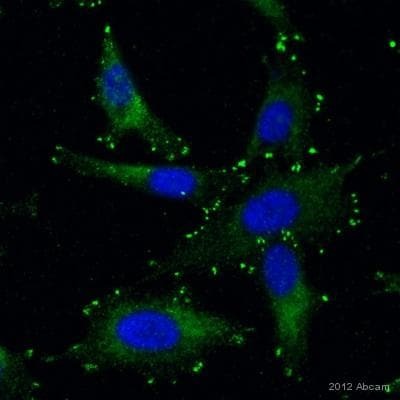 DOI 10.1074/jbc.M111.298117 January 2, 2012 The Journal of Biological Chemistry, 287, 148-158.
ab41827 staining BCAR1 in stable PC3 cells by Immunocytochemistry/ Immunofluorescence. Cells were counterstained with DAPI (blue). Publishing research using ab41827? Please let us know so that we can cite the reference in this datasheet.